Hello Android, Hello Windows Phone. I was an early iPhone adopter, buying an iPhone 3GS back in 2009. Within a year, I turned my attention to App Development on iPhone, and shortly afterwards the newly launched iPad. My Apps continued to be developed exclusively for iOS until late 2013, when I attended the Samsung Developer Day in London. Shortly after, I began to dabble in Android Development, and my first apps had arrived in Google Play, the Amazon Appstore for Android, and the Samsung Apps store, by the end of last year. The first app, possibly my most basic app, was one rejected in the Apple App Store for being so simple - Baby Night Light Stars. This turned out to be a good choice in terms of getting to grips with Android Development, and understanding the User Interface .axml layout files it uses. After a few more apps, I ported my SEO Apps range, including Website SEO Checks and Keyword Density. In march, it was time for another event down in London, focused on the Nokia X Android Platform, and so my apps began their journey to yet another app store, offering a unique opportunity to be part of a brand new and exciting outlet. My Grid Reference Apps followed next, including the entire 'Compass' series and the flagship GB Grid Ref Worker. I also took the opportunity at that point to introduce some 'Android Exclusive' free apps, which were spinoffs of the Grid Reference series, supported by Ads from Google's AdMob platform. At the end of May 2014, Microsoft's Global //publish/ event provided me with the opportunity to 'port' to yet another platform, Windows Phone. My first WP8 port was Grid Ref UK and Ireland, and now seven of my Grid Reference apps are now making waves in the Windows Phone Store, including the two free offerings, which perform even better in the WP Store than they do on Android. As of July 2014, the Mr Methane Fart App has been released in Android Markets. This app was originally developed for the iPhone back in 2010, using C++ and DragonFireSDK. However, we missed the boat by just days, deciding to submit the app after Apple had released new guidelines stating "We don't need any more fart apps". The App was rebuilt in Xamarin.Android, and it is great it is now public, 4 years after inception. The Majority of my older iOS Apps were written in Objective-C. I converted these to C#, developing the Android versions with Xamarin, which I now also use for iOS Development. This aided the journey to Windows Phone, as much of the C# Code was portable into a native Windows Phone development environment. 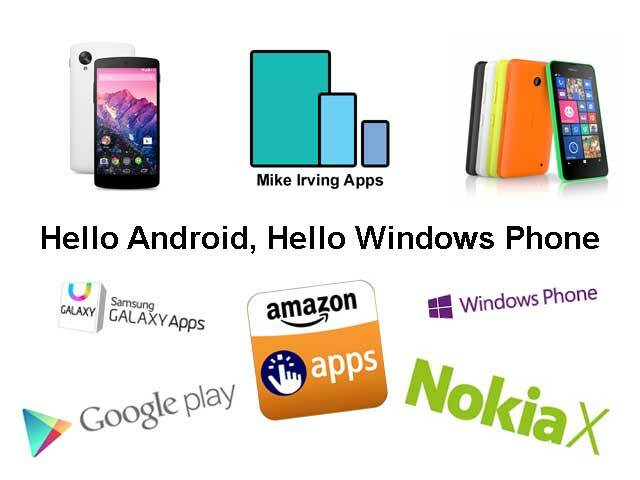 Different apps have had differing levels of success for me, on the different platforms: iOS, Android, Windows Phone. Indeed, Google Play is not necessarily my best performing Android outlet, something which came as quite a surprise. I guess some of my apps benefit from being part of the less crowded marketplaces, namely: Amazon, Samsung Apps, and the Nokia Store. Personally, I'm still an iPhone user. If I was to jump ship, I would predict a jump to Windows Phone, as I have been really impressed by the system, and it is more unique than iOS or Android. More conversions, spinoffs, and free apps, are planned. At some point I'll get on to developing some 'new' apps, and it is likely that I will target iOS, Android and Windows simultaneously in future.